West Highland White Terriers are adorable, loyal and adventuresome dogs, packing a whole lot of energy into a small frame. If you’ve ever had a Westie before, or knew someone who has, you know how much fun they are, and what great members of a family they make. If you’re considering getting a Westie or have a dog you think might be a Westie, it’s natural to wonder whether your dog is purebred or not. Fortunately, there are a number of standards and characteristics which will allow you to easily determine whether a Westie is purebed. What Does Purebred Actually Mean? First of all, it’s probably to get an idea of what the idea of ‘purebred’ means and what significance it has. The simplest definition of purebred is that a purebred dog has both a mother and a father who are the same breed. So, in this case, if you know for a fact that a dog’s mother and father are both purebred West Highland White Terriers, you can be confident that the offspring dog is a Westie too. If you don’t have a way to verify what type of dogs were the mother and father, there are some other ways to determine whether a Westie is purebred or not, based on certain physical and temperamental traits or even a DNA test. In one sense, purebred doesn’t really matter – dogs of all shapes, sizes and lineages are lovable and loyal companions. Being purebred doesn’t make a dog ‘better’ than another dog. However, what the idea of purebred brings is a set of expectations about a dog. Most obviously, it’s the physical characteristics, like a Dachshund’s (wiener dog) distinctive long body or a Great Dane’s huge size, but breed standards also relate to a dogs temperament. Getting a purebred dog can give you a pretty good idea about how that dog is going to look and act. Though all dogs are individuals, traits within breeds will give you a pretty good idea what to expect. Now, one easy way to determine if your Westie is purebred or not is getting a dog DNA test done. While this can take some time and cost some extra money it is still one of the easiest ways. You do have to remember that the at-home DNA tests for dogs which use a cheek swab are not the most reliable (and can take a long time to get the results back). If you want the most reliable, I would opt to do a blood DNA test through your vet. Just remember that can be a lot more expensive. I could go on and on with this topic but I won’t here. Maybe a blog post in the future? There are a number of kennel clubs which offer breed standards for Westies. A kennel club is an organization that concerns itself with the breeding of purebred dogs, and some of the most famous international kennel clubs are the American Kennel Club (AKC), The Kennel Club (based in the United Kingdom) and the United Kennel Club (based in the US). All three organizations have standards for the West Highland White Terrier breed, all of which are virtually identical. If you want to know whether your Westie is purebred, you’ll need to see whether its characteristics match what these kennel clubs have listed. From a general standpoint, the breed standard for a Westie is that of a small, strongly built dog, standing about 11 inches at the shoulder. Westies should be deep in the back ribs and chest, with a level back and strong legs and hindquarters, and a white double coat. 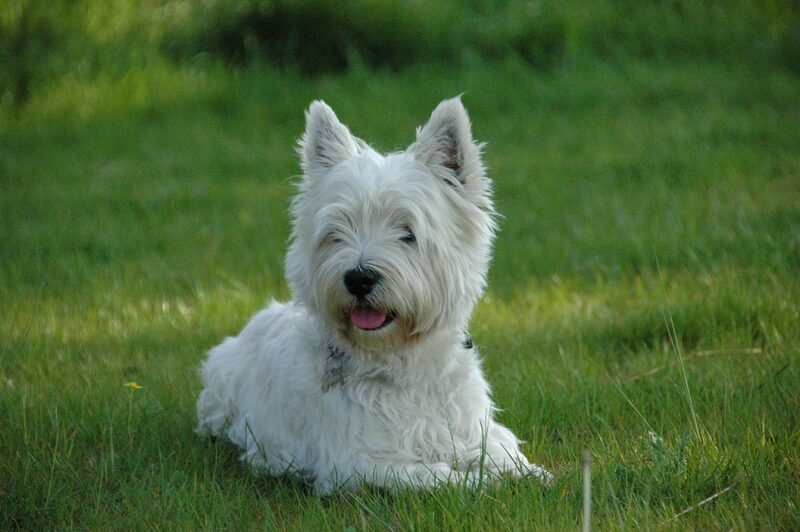 Head – Westies should have a slightly domed skull, tapering slightly at the level of eyes and ears. A strong and level jaw, with a large, black nose. Ears – Westies’ ears should stand up straight, and end in a point. They should be set midway on each side of the dog’s head, neither to close together or spaced too widely. The hair on a the ears should be short, and shouldn’t be cut or trimmed. Eyes – Westies should have wide set eyes of medium size, dark and set underneath heavy eyebrows. This gives the Westie a piercing, intelligent gaze. Eyes of a lighter color are a strongly undesirable trait. Mouth – Westies have large teeth for their size, with upper teeth overlapping closely with lower teeth, squarely set within the jaw. Body – Westies should have a compact and muscular torso, with a flat, level back and broad loins. They should possess back ribs set at significant depth. Hindquarters – Westies should have wide, muscular hindquarters, with short, strong legs. In particular, the thighs should be very powerful. Tail – Westies should have a tail of around 5 to 6 inches long, and it should be as straight as possible. The tail should stand out from the body, but shouldn’t constantly be perpendicular to the body. Gait – A Westie should move easily and freely. Stiff movement is an undesirable trait in Westies. Coat – This is probably the most recognizable characteristic of purebred Westies. They should have a double coat of pure white hair. The outer coat is of harsher hair and should be around 2 inches, and should not be curly. The undercoat, in contrast, should be softer hair and should be close. To sum it up, you can determine whether your Westie is purebred by using the American Kennel Club breed standard checklist, or the checklist of another major kennel club. Most of the determination is physical – the dog’s color, size and structure all most fall within the guidelines. A purebred Westie is a small but sturdily built dog, standing around 10 to 11 inches at the shoulder. They’re especially notable for their pure white double coat, which is probably their primary characteristic.